Hi everyone! I’ve finally come out of my shell, and here are some ICSE Class 10 Notes on the Excretory System, as promised to a follower. The content has been collected by me through various textbooks and classroom lectures taken by my Biology teacher, Mrs. S**** M*****. A very big thank you to her, for her insight and deep knowledge of the subject which she so generously shared with us. 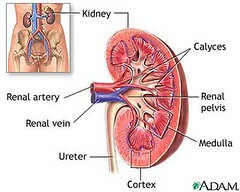 These study notes include definitions and important points to note regarding the excretory system, as well as an outline of the processes by which urine is formed, along with the help of various diagrams. The diagrams used in this study material have been carefully selected through Google Images. However, as I do not remember from where I obtained those images, I have not been able to list down all sources of these diagrams and pictures I have used in my notes. If you find that I have used one of your diagrams, and would like me to give proper credit for the same, or would like me to not use the diagram at all, please leave a comment and I’ll get back to you. Please send the notes for nervous system. Thank you so much for these notes. Hope it will help. All the notes, papers and tips especially for biology and geography are really very helpful for me. I cannot thank you enough for the great help you provide me with. Keep doing the good and may God bless you!! Thanks again! Thank you for the kind words. We are indebted to readers like you. Glad we could be of help. May God bless you, too. Take care and best wishes for the future. Thanx a lot…it helped me a lot……. Finally i goy something which is awesome….. Thank you for your positive feedback! We’re so glad we could be of help to you. 🙂 Do keep visiting! Thank you ,sir these notes are helping me a lot .I want definations of biology 10 can u pls help me out. I’d like to reiterate the fact that as students, we can only provide notes of the topics and subjects which we, ourselves, have studied. As we have not been taught the Merchant of Venice, we don’t have the relevant notes for the same. UPDATE: A reader has contributed his notes for Merchant of Venice: Act 1, Scene 1. You can access his solved questions for the same here. Any chapters in particular for chemistry? Hope this helps! If you have further questions, please do not hesitate to ask.